I think people talk too much about minimalism. What is it, I wonder, that not only compels me to simplify my life but to go through the rather complicated process of writing about it, too? And why would you bother to exert the effort to read what I have to say? It would be simpler for both of us, actually, just to sit quietly. So why do those of us who write about minimalism have so much to say when it takes more than minimal effort to say it? Here are the top four reasons I think there’s so much being written these days about minimalism. Maybe you’ll find within them them the reasons you’re reading. 1. Minimalism and writing go together to like minimally processed organic peanut butter and no-sugar-added jelly. Writers, even the most flowery among us, are constrained to minimalism by the limitations of words anyway. Some of us hope to make some money. Some of us write to help us clarify our own goals. Some of us write because we feel compelled to do it. Whatever the reasons we write — and no matter what we write about — writers are reducers. We reduce complex ideas into simple words. It’s what we do. 2. Lots of us are forced into it anyway. People write what they know, and lots of people are forced into simpler lifestyles by finances and situations anyway. I’m not cut out for a world full of cubicles, although I tried it for three or four years. Leaving the world of sameness often results in financial insecurity, and I wouldn’t have it any other way. Peace of mind trumps financial security any day. 3. Others have found success saying it. 4. There’s something called convergence. This get sort of heavy here, I’m afraid. The spiritual types among you will already understand this, and the rest of you probably don’t want to. Convergence is a coming together, and when thoughts and writings on a particular topic begin to converge, there’s a chance of reaching critical mass — that point at which the world tips a bit and minority opinions become the majority. 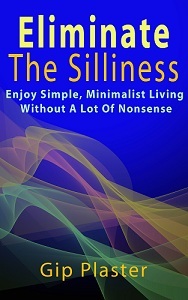 Can you imagine how the world would be different if those who practice minimalism and simplicity were the majority? So why am I talking so much? I’d like to make money blogging about a simpler life, and I don’t have much money now, so a simple life is my best option. And I’m a lifelong writer, so I understand the necessarily minimalist presentation to which words constrain us. I’m writing because for the moment, it’s what I’m compelled to do. And I’ll keep doing it, whether I become part of a simpler majority or not. And why are you reading? Did you really expect me to answer that? It seems like a job better suited to you. I look at it the other way around. Like you, I’m a professional writer who is (learning to be) a minimalist. I can’t help writing about my own experiences – it’s irresistible after reading so much about it and taking it on board. And I learn something from everybody’s personal take on what might seem to be the same message. This is a very interesting post. I think there are very good reasons to live a minimalist life. It can be a practical habit to instill and I agree that encouraging others to follow suite can have positive effects. Thanks! Thanks for your comments. And Joe, welcome to this community. I’m anxious to hear everyone else’s opinions, too. Hmmm… It seems that now that I have ‘minimalized’ my physical possessions I have actually ‘cluttered’ myself with words and thoughts. While I always had a cluttered mind it was full of useless and unproductive thoughts a good part of the time. Now I find that I want to learn more about different things and share them with the world. (Could be why when I look at my blog now-that was supposed to be about frugal & minimalism when I started out -is turning into a newspaper full of information). Oh well, I could have bigger issues I suppose. @finallygettingtoeven – I love it! Less stuff, more thought – that’s what the world needs! Thanks for your comments Jan and Jess. Less stuff equals more thought… It makes sense to me. I’m thinking I have some decluttering to do! Why bother, well I think humans are hard wired to share & communicate ….. add that to the fact we tend to congregate whether in the physical/virtual world with like minded people 🙂 then guess what happens ? but as finallygettingeven said less stuff more thought now that can’t be a bad thing can it ? BTW love the “Minimalism and writing go together to like minimally processed organic peanut butter and no-sugar-added jelly” phrase – that cracked me up big time ! I’m glad you liked this one, Alex. I’m making myself hungry re-reading that sentence. But I don’t have and PB or J.
Communication is important, and we are wired up to do it. This goes right along with the piece about Everett Bogue turning off comments that I posted this week.